Get the job done in one shot! 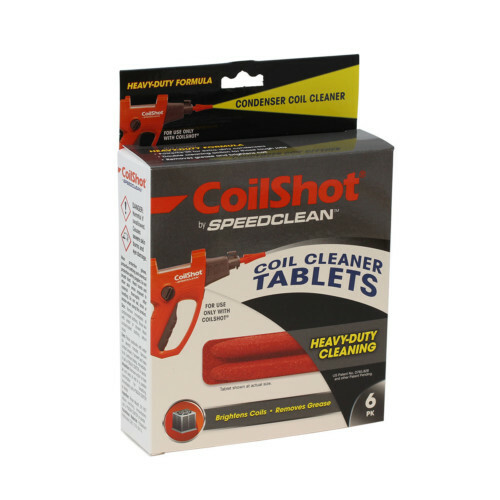 The CoilShot® condenser cleaner tool and tablet system make cleaning condenser coils faster and easier than ever before. 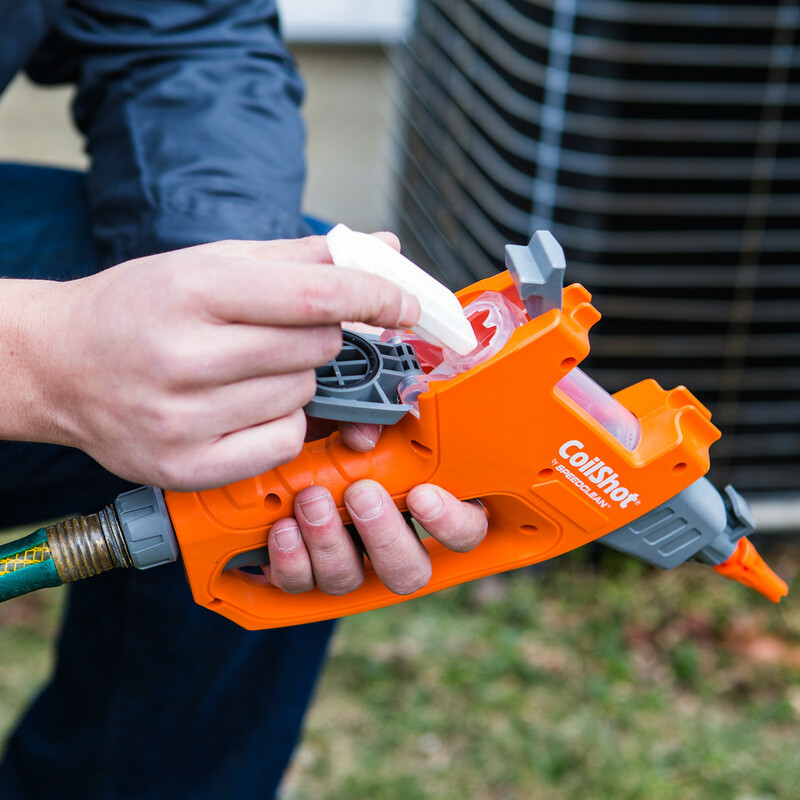 The unit connects directly to a garden hose and uses a single pre-measured tablet to apply foaming coil cleaner directly to coils. For added cleaning performance, use it with the optional 3ft wand. The innovative technology quickly cleans coils of dirt, grime, and even grease*! Eliminate the need for lugging around and measuring heavy, bulky liquid coil cleaners. Quickly and easily clean single-pass condenser coils in minutes. Replaces bulky liquid coil cleaners with small tablets. Plant friendly and grease-fighting formulas available. Saves on the hassle and waste of liquid coil cleaner. 1-2 tablets per job are all you need. * When used with CoilShot-HD tablets. The new CoilShot® condenser coil cleaner is redefining the coil cleaner market. This powerful coil cleaning tool uses a revolutionary tablet-based system that’s easier to carry, prevents wasted coil cleaner and eliminates guesswork – just one pack of tablets replace an entire case of coil cleaner! Tablets are lightweight, create a safer work environment and are compact in size – leaving more room for more important materials to fit in the truck. 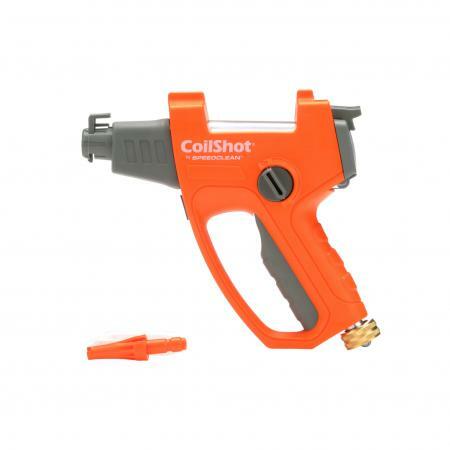 The CoilShot® tool is designed to propel cleaner deep into coils for a better, more superior clean in just a fraction of the time. 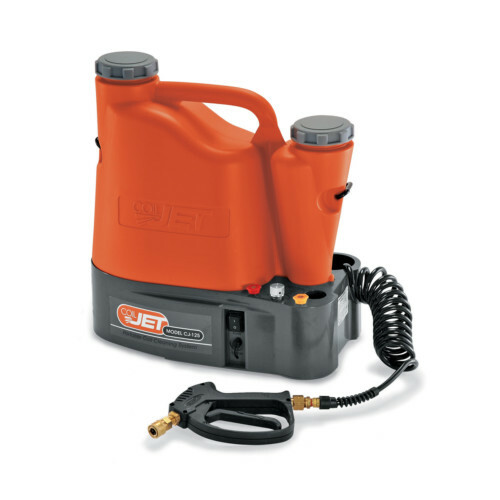 It attaches to standard garden hose and also features quick connect fittings for easy accessory attachments. 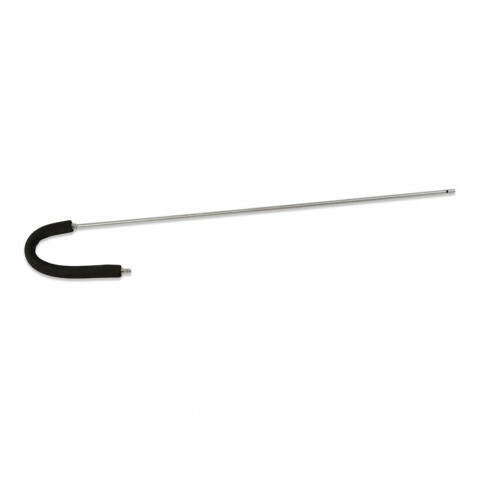 For more flexibility and better cleaning, use with the optional 3 Ft. CoilShot® Cleaning Wand. How does the CoilShot work? 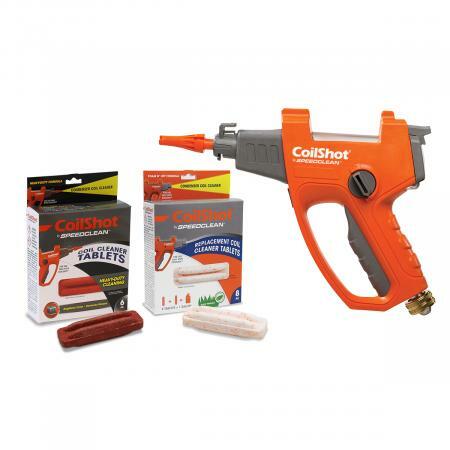 The CoilShot system uses a combination of water pressure and flow AND a chemical tablet to clean coils better and faster. The combination of water flow and pressure help to dislodge materials from deep within the coil without using an excess amount of chemical, while the tablet provides the foaming performance to aid in cleaning coils. 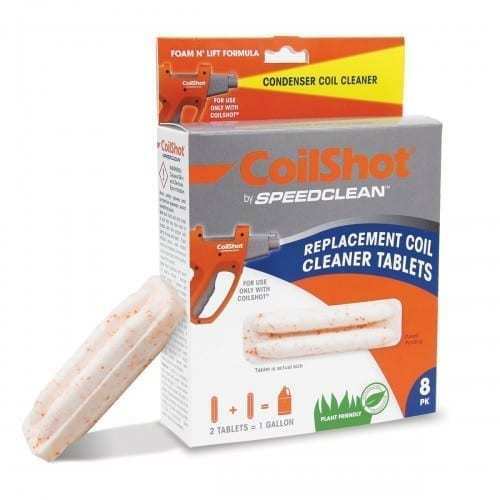 The standard formula CoilShot pre-measured coil cleaner tablet is designed to last for 8-12 minutes. The time is also impacted by the foaming level you choose. The more foam you choose, the less time the tablet will last. The answer to this question depends on the size of the coil and how dirty the coil is. 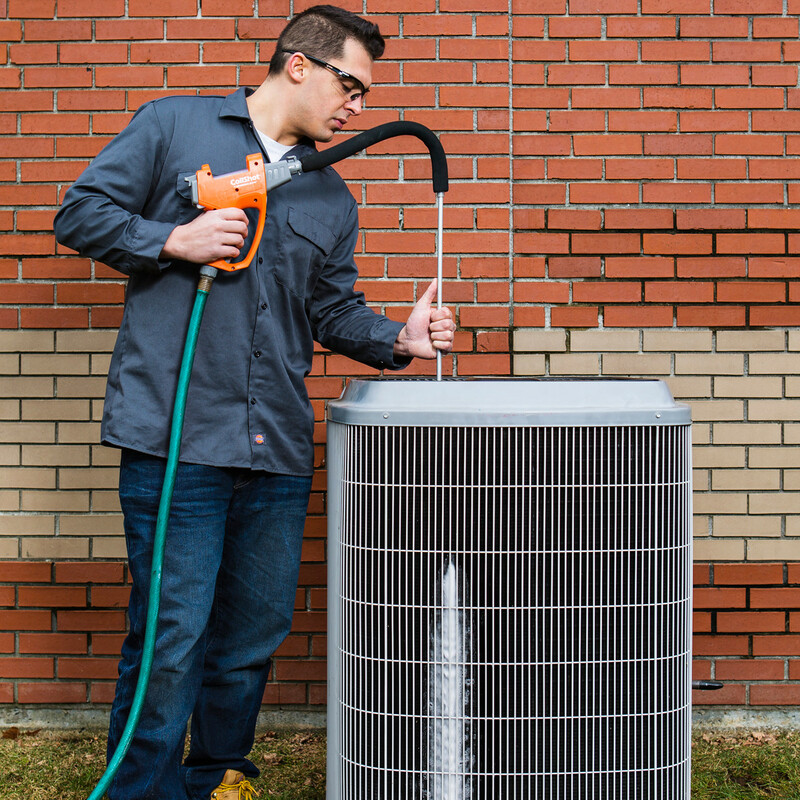 In general, you can clean a 3-ton condenser with moderately dirty coils with one tablet. Dirtier condensers or larger units will require more than one tablet. 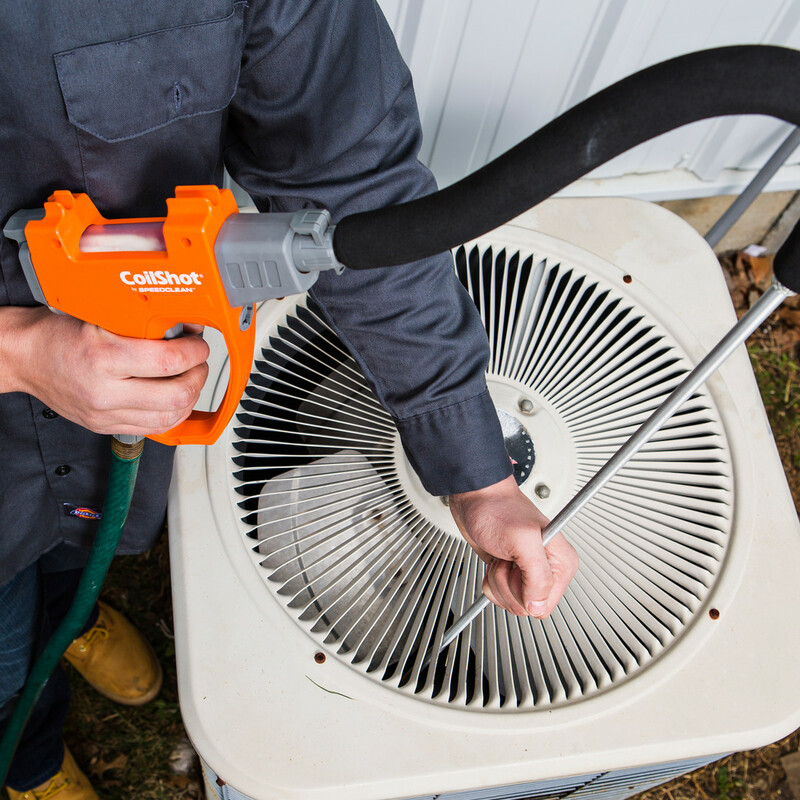 The CoilShot is designed for cleaning smaller residential and light commercial condensers with single pass coils. This is generally in the 3-ton range, however coils and condensers come in multiple configurations so cleaning results will vary depending on coils thickness, level of dirt and other factors. Where can I find a manual or other support documentation for this product? You can find support materials by visiting the support page for this product.